The trio of hotels that sit at the intersection of Clark and Grand Streets in downtown Chicago boast three separate hotels under one roof. 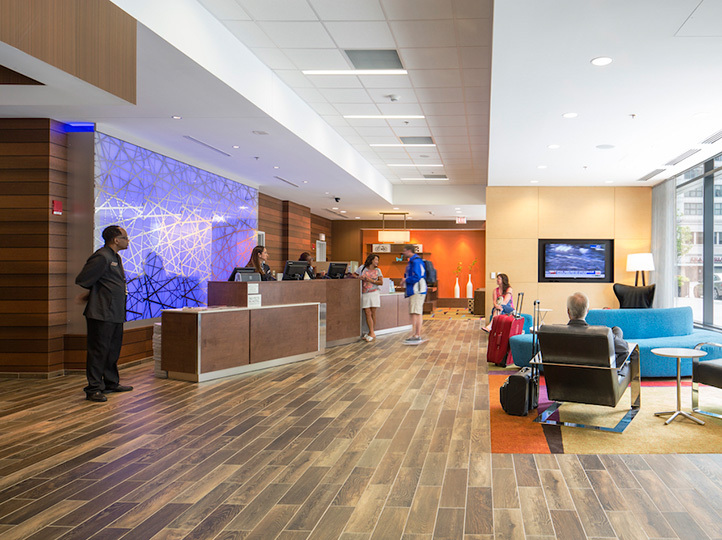 Commonly referred to as Clark and Grand Hotels, Aloft (Starwood), Hyatt Place (Hyatt), and Fairfield Inn and Suites (Marriott) each have their own unique brand standards but are all under the same roof. The build out was one process rather than by individual hotel, making this job one for the ages. Freidman Properties, Ltd. partnered with White Lodging Services and commissioned HOK and Lend Lease to design and construct the three distinct hotels. American Direct was awarded the procurement of both Division 8 and Division 10 product for the project. Accommodating the three different brand standards was definitely unique. One brand required plastic laminate doors, the second required painted doors, and the third brand incorporated “barn door” type doors. To be sure that all of the finishes were correct, two mock-up rooms, per hotel brand, were built on-site so that all finishes could be reviewed and approved in advance. As if the three-hotels-in-one challenge was not enough, the downtown location around trains, tight curves and overpasses posed strict limitations for transit, making product delivery challenging. A typical job would have utilized standard over-the-road trucks. However, this job limited all deliveries to a 30-foot maximum truck size. The smaller trucks may have been easier to accommodate, but smaller trucks meant smaller volume in the delivery, so more frequent deliveries were required than on a typical job. While this project posed a unique set of challenges, American Direct’s creativity and experience made this yet another job to be proud of.